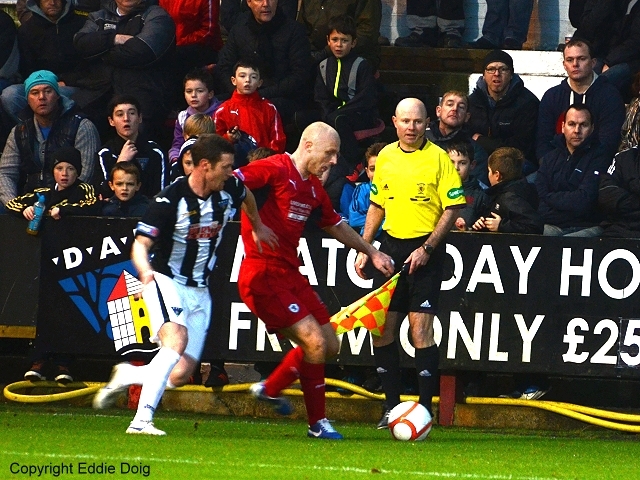 Raith made the short trip to Dunfermline for the first game of 2013. 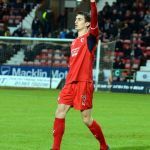 The Rovers saw the return of Jason Thomson to the starting line-up and Ross Laidlaw retained the keepers gloves to make his 10th appearance of the season between the sticks. The pitch looked not bad considering recent weather and the game kicked off with the visitors defending the goal in front of the vocal travelling support. 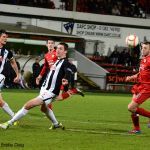 The Rovers were trying to support front man Graham with Spence and Grant Anderson playing wide with David Smith in a central role. 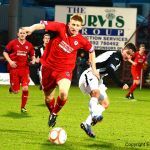 In the first minute Kirk was offside when he got onto a ball forward but uninterrupted by a flag the Rovers forced him to play the ball back. 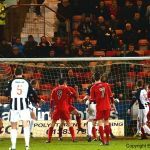 Walker coolly mopped up in the Raith box then following a free kick Graham was offside when the ball was played forward a second time. The returning Thomson put a driven cross into the danger zone but Spence wasn’t close enough to capitalise. Then Kirk tried to bundle in a far post cross with his chest but he put it past, Laidlaw was in attendance and seemed to have it covered. Smith and Spence darted down the sideline and keeper Gallacher was quick to run out of his box and leathered the ball over the stand! In the 11th minute Mensing’s great pass down the line to Anderson was crossed by the speedy wingman. 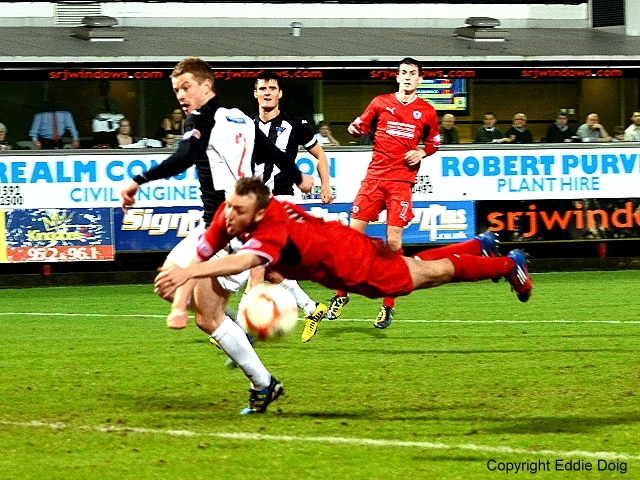 Graham got his head to the ball but Gallacher was able to hold the close range header at the near post. Brian would have wanted to put more power on that effort. At the other end Athletics Thomson fell to earth rather hopefully near the edge of the Raith box and was rightly ignored. 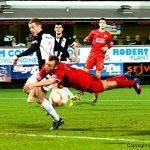 Moments later there was a foul when Byrne caught Spence late and the home man was rightly booked. 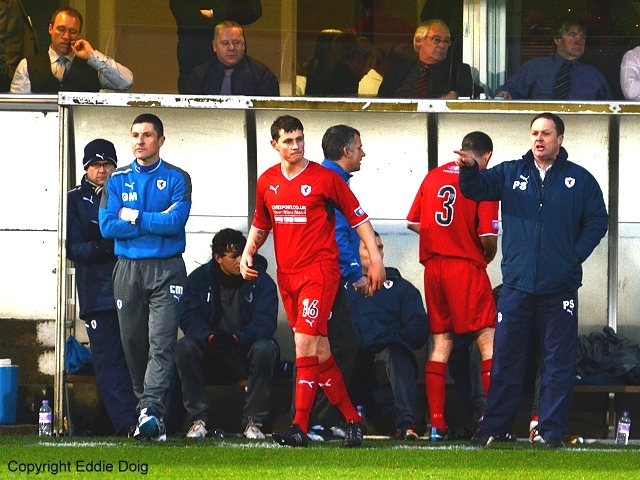 Eddie Malone required treatment after 20 minutes and then the Raith wall did it’s job against a direct free kick. From the resulting corner Morris headed powerfully over. 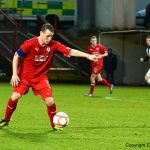 In the 25th minute the struggling Malone was replaced by Reece Donaldson. In the 28th it was Laidlaw’s turn to be quick off his line closing down the speedy Wallace wide and the defence combined to clear. 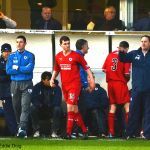 There was a moment of crab football as two home men tried this unorthodox tactic in the box until the referee intervened. Mensing was penalised having won the ball well and booked for his reaction. 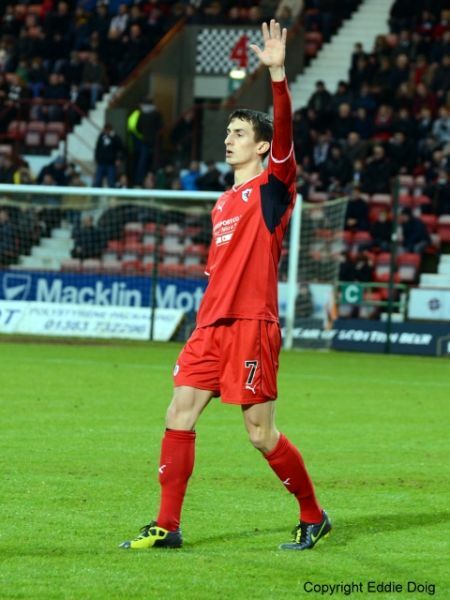 Falkingham was spoken to after fouling Thomson, by no means his only transgression. 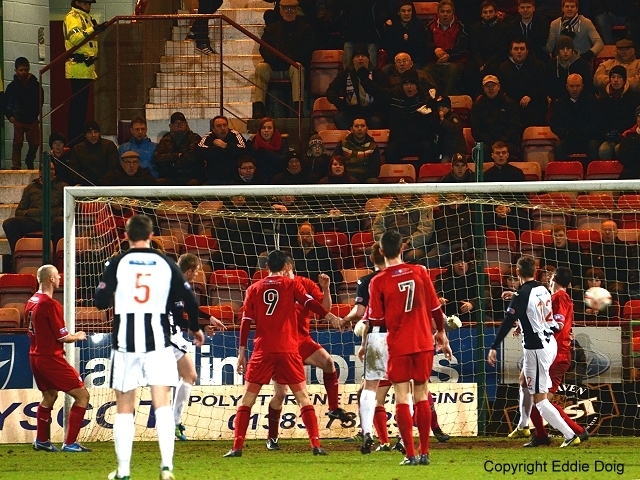 Hamill put a free kick well over from the edge of the box and the half ended with Donaldson being booked for a foul. The second half started with Ross Wallace driving a shot just over a concerned Laidlaw’s bar. 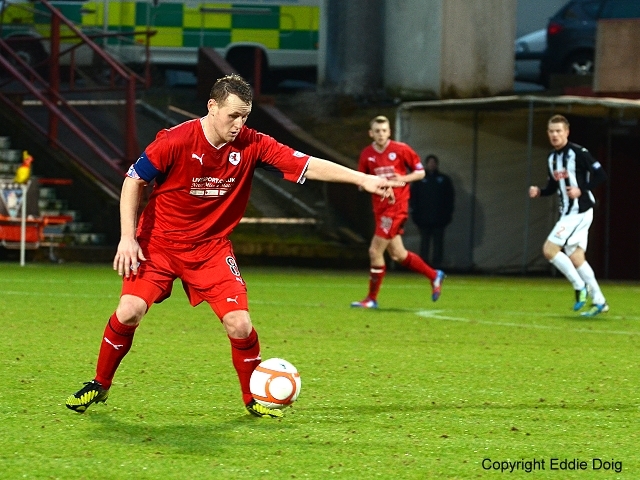 Grant Anderson then worried the home side again with his pace winning a corner. From the resultant ball in Graham headed goal-ward only to see it blocked on the line. The second effort sneaked just the wrong side of the post. 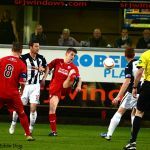 Wallace ran from midfield as the Rovers defence stood off but they were relieved to see his effort go wide from 26 yards. 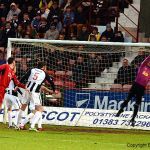 On the hour Dunfermline had a chance when a far post cross was fired wide though the front man looked suspiciously offside. Midway through the half Hill went down and received some treatment. Play resumed with another free kick to the Rovers and Walker’s wicked free kick flashed across goal invitingly but just eluding Spence’s dive to head at goal. Another opportunity had gone a begging. Geggan’s well timed run ended with him heading home from 5 yards. One nil to the home side. 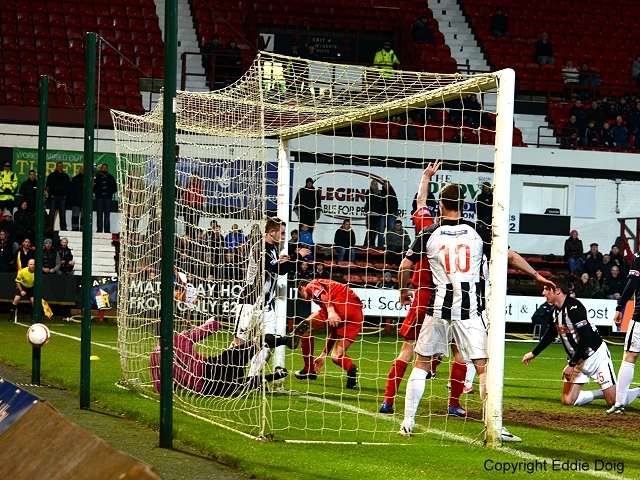 As the Rovers pushed on Grant Anderson was fallen on by a home man, it was accidental, but Jordan the Pars defender will have been pleased to see him slowed after giving away a couple of corners so wary was he of the Raith mans speed. In the 76th minute Gallacher earned his money making a great save after Smith’s good ball played in Walker. Aldo then sent a dipping free kick just over after Byrne was penalised, again. The ever eager Spence nearly made a goal out of nothing when he closed down and robbed the ponderous Morris who just recovered to half block the youngsters shot wide. Walker had another effort then the hosts Thomson could have wrapped it up, Hamill let him get into the box unhindered and his low effort flashed across goal and past. 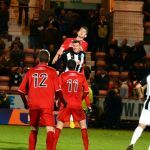 The Rovers pushed for the equaliser with a couple of long range free kicks into the box and then a pair of long throws which were broken up by some delaying play from the home side. 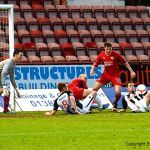 A break at the death saw Dargo played in but Laidlaw did well to get something on the shot before a Raith man on the line removed the danger. 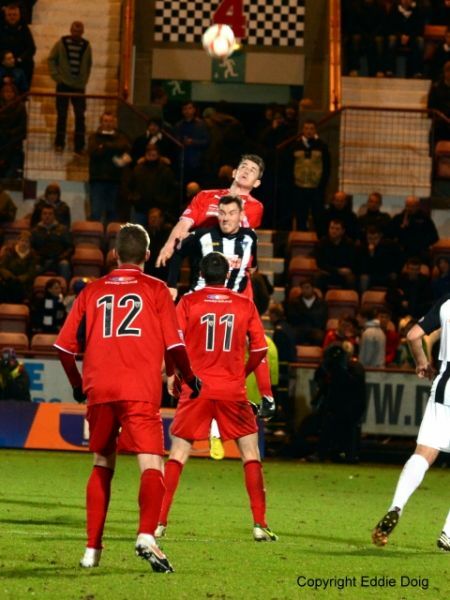 The game ended 1:0 to Dunfermline. The Rovers did better than their last visit to East End, when they didn’t do themselves justice. Thankfully after the last two games the referee was rarely seen or heard though the hosts did attract more of his attention. On the day the home side deserved the win however sadly their Board will have been much more interested in the number of paying customers than the result. 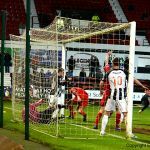 Perhaps the most neighbourly thing the first footing Rovers could have done to ease DAFC’s financial problems was to prevent them having to scrape together a derby win bonus but it wasn’t to be. A happy New Year from RRA and the web updaters. Rovers. Kick off towards the West Stand. Walker intercepted a dangerous ball in the box and calmly clears. Graham shoots from the edge of the box but is offside. Thomson fires a tempting ball across the goal but no takers. Kirk heads into the side net from six yards. Graham crosses for Spence to head the ball into the hands of Gallacher. Mensing denies Kirk at the 18 yard line. 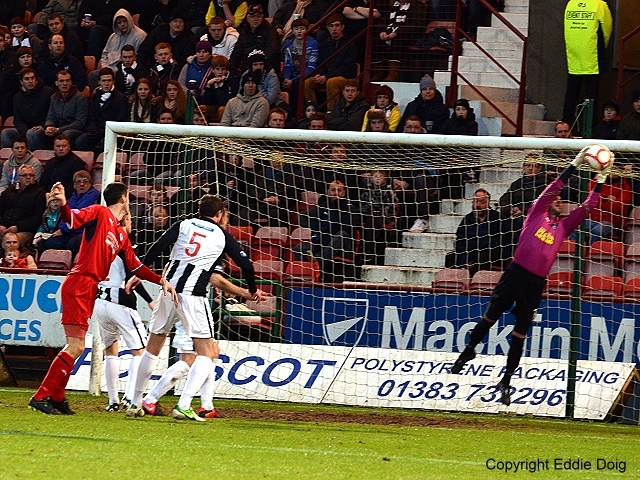 Dunfermline free kick from 24 yards came off the wall for a corner. The cross to Morris is headed over. Kirk, with back to goal turns and shoots wide. Wallace crossed into the box, Hill headed clear for a corner. Mensing yellow, for playing the ball. Both sides having a go, Dunfermline edging possession. Geggan sclaffs the ball wide from just inside the area. 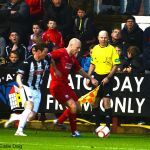 Thomson brought down, Geggan yellow card. The game is flowing back and forth, but no clear threat is emerging. Cardle tries a Cruyff turn at his own corner flag but concedes a corner! Comes to nothing, but worth it for the comedy! That's all folks. Poor performance by Rovers, plenty of fight but no guile in attack. Gallacher, Geggan, Jordan, Dowie, Morris, Byrne, Cardle, Thomson, Wallace, Kirk, Falkingham. Subs, Barrowman, Dargo, Potter, Husband, Hrivnak. Laidlaw, Thomson, Malone, Mensing, Hill, Hamill, G. Anderson, Walker, Graham, Spence, Smith. Subs, Clarke, S. Anderson, Ellis, Donaldson, McGurn.